There’s no place like home for the holidays. That’s exactly why moving and the holiday season don’t mix. As the holidays and relocating are overwhelming in their own ways, make sure to prepare for anything and prioritize. Are you reading this because a holiday move is unavoidable? Don’t worry, we’re here for you! Here’s how to successfully plan for a move in November, December or January. The slowest time for (almost) every business is the week right after Christmas. You’ll see less traffic and more downtime as people relax and enjoy their gifts. Moving right after the holidays also gives you the chance to enjoy the season with your loved ones. A proactive move is a happy move. Stay on top of your preparations. Even if your house doesn’t have an offer, you can still pack your nonessentials. You can also use this time to separate the items you won’t take to the new home. Complete your holiday shopping early. We recommend shopping online and finding a place in your home exclusively for presents. Make sure to keep gifts separated or you may find them accidentally packed. Try to donate as much as possible. This is the perfect time of year to help a family in need! If you’re getting rid of old toys, here are charities that help children at Christmas time. Most of us want to spend our seasonal time with friends & family; not packing endless amounts of boxes. If you budget wisely, you may want to hire full-service movers. A full-service move means the professionals will handle every aspect of your transition. These moves usually entail disposal, packing, clean out, dis- and re-assembly and (of course) moving. This will keep your stress down but hurt your wallet in return. As you budget for your move, remember to also put funds aside for your holiday shopping. In addition, full-service moves may require a few days of preparation. Consider this as your review your schedule. The holidays are usually spent gathering around & enjoying a home cooked meal in a well-decorated home. If you’re usually the host, consider changing the tradition this year. If you’re able, make a reservation at a nice restaurant and invite your immediate family. Since the word is out that you’re moving, many will understand your predicament and make plans elsewhere. If you’re trying to host a simple, budget friendly holiday, host a potluck. Use paper plates and plastic utensils so you can pack your fragile ware beforehand. For more tips, click here! Whether you’re moving yourself or hiring professionals, always have a back up plan in case of inclement weather. Certified moving companies will cease operations if they believe the conditions are too hazardous. Plus, you wouldn’t want to risk your items being damaged – or worse. Stay on top of the weather forecast and especially avoid any travel if a state of emergency is declared. If you need storage solutions, consider climate-controlled for your winter move. You may have items that could sustain damage from cold temperatures. 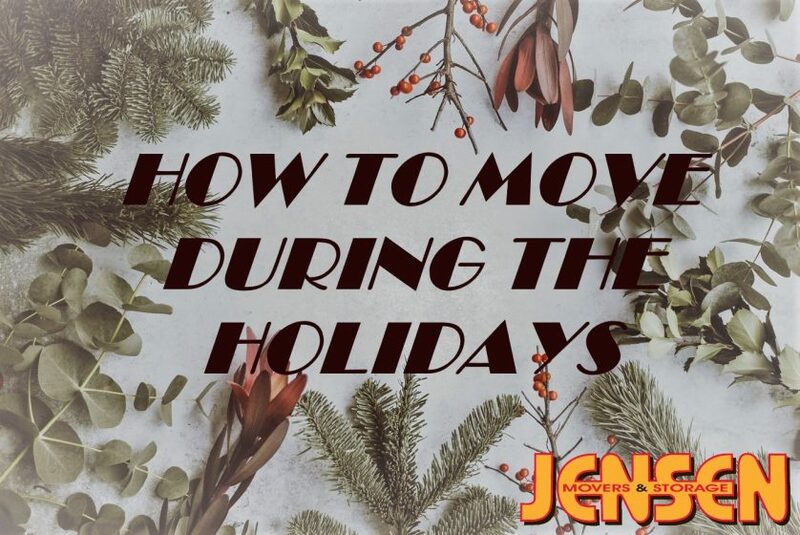 It’s a given that you’ll be stressed out between preparing for a move and engaging in holiday festivities. The people around you will be in good spirits, so try to surround yourself with their positive energy. If you’re moving before the New Year, think about the excitement of a new beginning. You will have plenty of memories to look back & laugh on once your holiday move is over. Try to stick to your normal routine to the best of your ability. Sleep well, exercise regularly and eat a balanced diet. Time management is key. Keep the holiday spirit alive! You can’t deck the halls, but you can use quick and easy decorations. Try to keep one room decorated until the last minute. Most people agree: buy the tree! Keep your Christmas tree small and simple. Play uplifting Christmas music throughout the home. Take some time, even if it’s minimal, to enjoy the season. This could be a single day trip or an evening out. If you have kids, plan occasional drives to look at Christmas lights. For those traveling long distance, stay in a hotel that’s well-decorated and holds holiday events. A new place to call home for the holidays sounds wonderful but can certainly keep you on your toes. If you stay joyful and manage your time wisely, you’re sure to have a memorable holiday. We wish you all the best in your new home and a holiday filled with cheer!